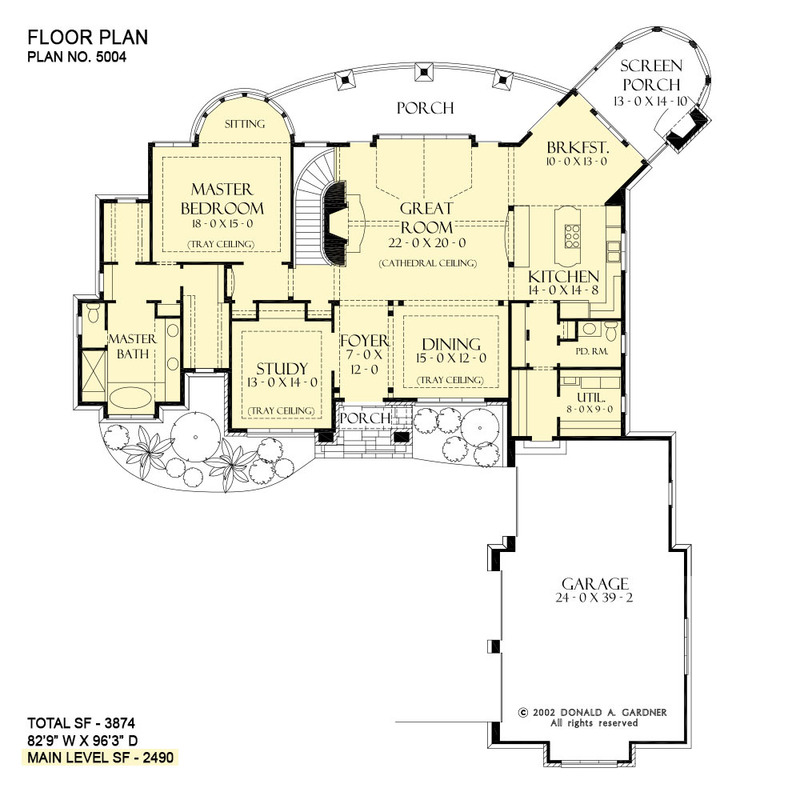 Old World elegance is created by a beautiful combination of stucco and stone in this home plan. A towering entryway makes a grand impression on the front facade, but the rear elevation - with its turret and covered porches - is just as magnificent. Each floor of this hillside walkout has a striking fireplace that is a major focal point. Tray ceilings crown the dining room, study and master bedroom, while a cathedral ceiling tops the great room. A pass-thru connects the great room to the kitchen. A three-car garage, large utility room and hall storage adds convenience to the home plan. To further easy living, each bedroom is equipped with a walk-in closet - the master suite has two. 1st Floor: 2490 Sq. Ft.
Porch - Screened: 208 Sq. Ft. 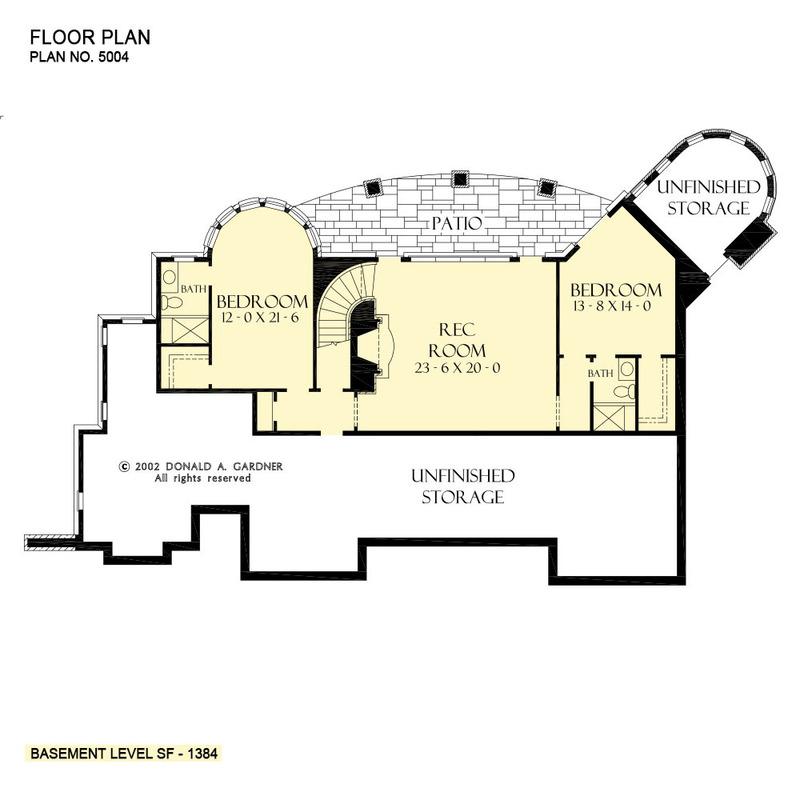 Unfinished Basement: 1218 Sq. Ft.
House Dimensions: 82' 9" x 96' 3"
Great Room: 22' 0" x 20' 0"
Bedroom #2 : 12' 0" x 21' 6" x 10' 1"
Bedroom #3 : 13' 8" x 14' 0" x 10' 1"
Bedroom / Study (Tray): 13' 0" x 14' 0" x 13' 1"
Breakfast Room : 10' 0" x 13' 0" x 12' 0"
Deck / Patio : 29' 0" x 10' 0" x 10' 1"
Dining Room (Tray): 15' 0" x 12' 0" x 13' 1"
Foyer : 7' 0" x 12' 0" x 10' 0"
Garage : 24' 0" x 24' 6" x 0' 0"
Garage Storage : 20' 0" x 14' 6" x 0' 0"
Great Room (Cathedral): 22' 0" x 20' 0" x 22' 10"
Kitchen : 14' 0" x 14' 8" x 10' 0"
Master Bedroom (Tray): 18' 0" x 15' 0" x 10' 11"
Other : 12' 0" x 6' 6" x 12' 0"
Other #2 : 23' 6" x 20' 0" x 10' 0"
Other #3 : 6' 0" x 8' 8" x 10' 0"
Other #4 : 20' 0" x 14' 6" x 0' 0"
Porch - Rear : 29' 0" x 10' 0" x 12' 0"
Porch - Front : 10' 0" x 5' 3" x 13' 11"
Porch - Screen : 13' 0" x 14' 10" x 12' 0"
Utility Room : 8' 0" x 8' 8" x 10' 0"